On June 25th, Putin made a surprise call to Obama after many months of animosities and for the first time since very long time on the initiative of Kremlin. It is not known exactly what was the topic of this unexpected call, but there is every reason to believe that it was urgent and had to do with the escalation in the NATO preparation for a global war against Russia as reported on many occasions in the past. On July 4th Putin had a second urgent phone call with Obama and nothing has been officially announced about this conversation. “At the time being, around 2,200 people from Russia are engaged in the fighting in Syria and Iraq,” Oleg Syromolotov, Deputy Foreign Minister for anti-terrorism, told TASS news agency on Tuesday. “Among them, about 500 came from Europe, where they had earlier obtained citizenship, residence permit or refugee status,” he stressed. The need to suppress “any moves” of Islamic State and other militant groups towards Russian territory, citizens and institutions presents a challenge for the government, according to the deputy minister. “We are thoroughly analyzing belligerent statements of IS leaders on transition of the “jihad” to Northern Caucasus and in Central Asia,” said Syromolotov. There is further reliable information that these terrorist groups receive all of their funding from the CIA through a number of secret Swiss bank accounts. This all is known to the Russians who are very carefully watching all the aggressive acts of the Empire of Evil against the Russian Federation and are prepared to respond immediately when the latter crosses the red lines set by Kremlin for the integrity of Russia and the security of its people. In the following, I am publishing a very good overview that discusses the political background of the recent urgent phone call between Putin and Obama on June 25th and what they might have discussed beyond what has been officially announced. After that I have published a second article that illuminates the military background of the second call on July 4th in the light of the recent ominous escalation in bellicose animosities of the Empire of Evil against Russia. All these events are flowing into the big stream of the ascension process and the demise of the dark ruling cabal in the West, who are now leading a futile battle on many fronts, and in particular in a state of constant strangulation by major financial crises, rapid credit and cash crunch and crashing equity markets worldwide. Also amidst rapidly growing civil unrest in the EU and the USA. You may have heard that President Putin placed a call to President Obama on Thursday, June 25th. As many in the media have noted, this call came after several months since they last spoke directly, and many more months of ‘estrangement’ and strained relations between the two. According to the Kremlin’s website, Putin and Obama discussed the crises in Ukraine, the ongoing war in Syria, the Iran nuclear deal and the growing menace of terrorism in the form of ‘IS’. 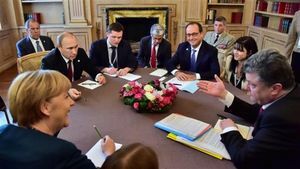 Out of this discussion, says the website, an agreement was made between the two presidents that Russian Foreign Minister Sergei Lavrov and US Secretary of State John Kerry would hold a meeting to discuss this last issue. It was also agreed that US Assistant Secretary of State Victoria Nuland and Russian Deputy Foreign Minister Grigory Karasin would be in contact to discuss implementation of the Minsk agreements. But as anyone who has been following the developments of all of these flash points might rightly predict, the meetings and the discussions to come will probably amount to absolutely nothing; the U.S. is relentless in its crazed drive for world dominance at any cost. And we know from Putin’s and the Russian government’s many protective countermeasures – militarily, economically and diplomatically – that they are acutely aware of this. So why make the call? Leaving this question aside for a moment, and the ability of Putin to engage in realpolitik when he needs to, a sampling of the Western take on the conversation will prove useful. 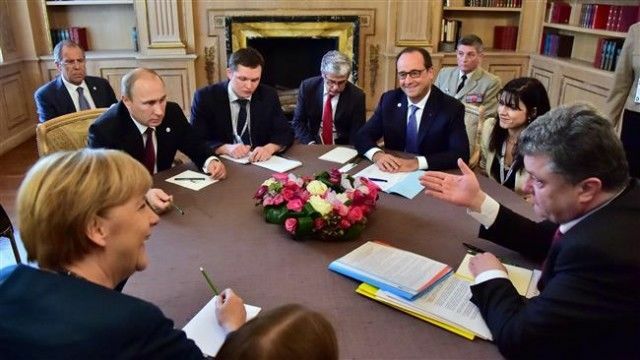 […] But American officials said that Mr. Obama focused on the continuing separatist war in Ukraine fomented by support from Moscow and pushed Mr. Putin to abide by a shaky diplomatic agreement known as the Minsk accord. Violence has flared in recent weeks even as Russia failed to drive a wedge among the members of the European Union who agreed to renew economic sanctions on Russia for another six months. “President Obama reiterated the need for Russia to fulfill its commitments under the Minsk agreements, including the removal of all Russian troops and equipment from Ukrainian territory,” the White House said. Where are the U.S. representatives to help broker the Minsk agreements? Of course what the NY Times article fails to mention is that both the Minsk I and Minsk IItalks were initiated by Russia and it has beenRussia that has continuously called on Poroshenko and Kiev to follow the agreementsmade in those accords. The Novorussian forces have pulled back its armaments according to OSCE observers – but it’s the Kiev forces that are not only amassing heavier artillery on the borders of East Ukraine, but have also continued shelling civilian homes,infrastructure and killing innocents there. Only the puppet masters in the U.S. have the power to stop this, but instead, they are supplying arms and personnel to train the Kiev military and effectively giving the green light for more violence. The Times also conflates the erroneous suggestion that Russia failed to stop the conflict in Ukraine with Russia trying to “drive a wedge among members of the European Union” regarding its response toanti-Russia sanctions. But the simple truth is that these sanctions are not only not working, but are negatively impacting the EU countries that have imposed them, the same countries that have fallen into lock step with the U.S. and its insane drive to ‘contain Russia’ and preserve US hegemony and warmongering capacity. And all of this because Russia supported Crimea – an area that identifies itself with Russian culture – in its truly democratic pursuit of self-determination and desire to not live under a U.S. coup-installed government that considers them “subhuman”. But the way that the White House describes the meeting for its mouthpiece the New York Times, someone could actually think that the U.S actually had some kind of hand in helping broker the Minsk accords when, in fact, it didn’t. Oh, and there are no Russian troops and equipment to remove from the Ukrainian territory. Mr. Putin’s decision to call Mr. Obama and focus on Syria and Iran may reflect a desire to assert his continuing importance on the world stage despite Russia’s isolation and failure to break the Western consensus on sanctions. This last part is just precious. Far from desiring to assert his ongoing importance (you can read that as politically ambitious) with the West, as the article is suggesting, Putin is trying to do something quite different by calling Obama, which we’ll get to momentarily. But the main point here is that anyone who has followed Russia’s development of BRICS, the Shanghai Cooperation Organization, its new gas deals with Turkey, among other things, knows that Russia does not need the West, strictly speaking.Putin just wants the U.S. to stop behaving like the megalomaniacal bully that it is. And, as all of President Putin’s new economic and political alliances indicate, he, and Russia, are the farthest thing from “isolated” – try as the NY Times would like us to think. The United States and Russia have been at odds over Syria. 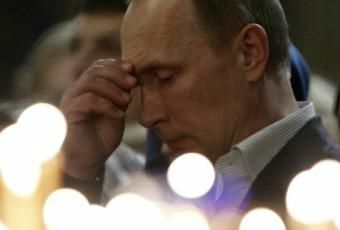 Moscow supports the government of President Bashar al-Assad, and Mr. Obama has called for his resignation. American officials hope Mr. Putin may see the rise of the Islamic State as enough of a threat to now be willing to apply pressure on Mr. Assad, but they also suspected his renewed interest in the issue may be a way of distracting from Ukraine. Oy! Where to begin? How about the fact that President Bashar al-Assad was and is the democratically elected President of Syria and the U.S. has no right whatsoever to meddle into the affairs of other countries. Or, that the last time the U.S. and NATO called for the resignation of a leader in the Middle East was in Libya: in the name of democracy and humanitarianism these killers literally destroyed a whole thriving country. Then there’s the little known fact that the Saudis and Israel (the U.S.’s geopolitical partners in crime) would like to see the new gas pipeline run through Syria without Assad’s say in who profits from it. And note the subtle insinuation that Assad is somehow responsible for IS! Young Syrian childrens’ lives lost. For what? It is remarkable to make note of all the many big lies this short Times article builds upon. To wit: Islamic State is the U.S.’s invention: a proxy force that helps create the pretext forcontinued war and, in recent months, the U.S. bombing and destruction of Syria’s infrastructure and deaths of innocents in order that it may “fight IS”. Never mind the unusual number of times that U.S.-air-dropped military aid “accidentally” gets into the hands of the jihadis. Further, there is no “renewed” Russian interest in the subject of Syria, because Russia has been – and never stopped being – engaged with resolving the conflict there, and supporting its democratically elected leader. Russia not only diffused the threat of Obama’s ridiculous ‘red line’, basically preventing the U.S. military from bombing Syria to kingdom come, ‘shock and awe’ style, but it also helped the world see that Syria was quite open and willing to dispose of its chemical weapons. This near disaster was based on the lie perpetrated by the West that Assad used chemical weapons on his own people. But we now know that this false flag was brought to Syria courtesy of Saudi Arabia’s intelligence services. Lastly, what for heaven’s sake does the following statement even mean? “American officials hope Mr. Putin may see the rise of the Islamic State as enough of a threat to now be willing to apply pressure on Mr. Assad.” As though Assad isn’t serious enough about fighting ISIL? As though Putin is somehow unaware of how dangerous IS is? Like so much of the thinking and writing that passes for sound foreign policy and legitimate journalistic coverage in the United States, that last statement from our friends in the mainstream media is unequivocally and absolutely absurd. When Voltaire wrote: ”Those who can make you believe absurdities, can make you commit atrocities,” he was talking about just this kind of pure and unadulterated toxic disinformation that is daily spewed by the New York friggin’ Times. As if the geopolitical turmoil of Ukraine and Syria weren’t enough, at present, there are brand spanking new flash points and pretexts for U.S./NATO forces to involve themselves militarily that are, by design,attempts to draw Russia into overt conflict with it and the West’s vassal states. So Porky Poroshenko probably got his directive from his CIA handlers to block the Russian peace-keeping force from Transnistria, leaving it ripe for annexation by Romania, a NATO member. Therefore any action taken on the part of Russia to improve on the security of this now tenuously autonomous region may be labeled – you guessed it – ‘Russian aggression’. Add to this Poroshenko’s appointment of Mikheil Saakashvili Sackofshitshvili to the position of Governor of Ukraine’s Odessa Oblast. This is the same Saakashvili who, as the former President of Georgia (that’s right, he’s not even Ukrainian)ordered the attack of South Ossetia until the Russian military drove them out. Needless to say, Saakashvili is pro-Maidan, pro-NATO, and pro-western. He is also wanted by the government of his own country for criminal charges. It seems that the Pentagon is considering far more mad moves than merely returning mid-range nuclear missiles to Europe. According to hackers who managed to enter the system of the Lithuanian Armed Forces, that tiny Baltic country is getting ready to militarily annex Russia’s Kaliningrad region. It reads like a fantastic rewrite of the 1950’s Peter Sellers satire film, The Mouse that Roared, with Lithuania cast in the role of the Duchy of Grand Fenwick, declaring war this time, not on the United States, but on the Russian Federation. Kaliningrad is a Russian Oblast today of some 960,000 ethnic Russian inhabitants. 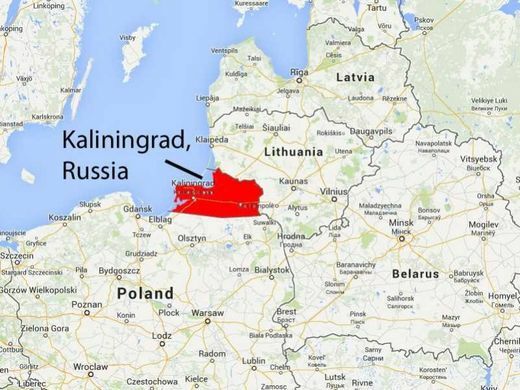 It became part of the Soviet Union in 1945, at the Potsdam Conference, when the US and British Governments agreed to the transfer to the Soviet Union of the city of Koenigsberg, renamed Kaliningrad, and the area adjacent to it. Because of Washington’s eastward expansion of NATO after the collapse of the Warsaw Pact, Kaliningrad is situated now between NATO members Poland and Lithuania on the Baltic Sea. Because it is the only Russian Baltic Sea port “ice-free” all year round, it plays a vital strategic role in harboring the Russian Baltic Naval Fleet and three Russian air force bases. When the Bush Administration announced it was stationing US missiles in Poland in 2007 as part of its upgraded Ballistic Missile Defense deployment, tensions between Moscow and Washington reached a break point, as Russia threatened to station nuclear weapons in Kaliningrad, a threat dropped in 2009 as a response to Obama’s feint, called “reset.” For NATO, using tiny Lithuania today as her proxy, to seize Kaliningrad, would amount to a declaration of nuclear war against Russia. According to Lithuanian news portal Delfi, the hacked documents of the Lithuanian Defense Ministry reveal that ongoing NATO maneuvers in the region would provide the cover for the surprise attack. Right now some 2,100 soldiers from nine NATO member states part of the Very High Readiness Joint Task Force (VJTF) are taking part in military exercises in northwestern Poland. Later this summer, NATO’s “Allied Shield” will be also held in Estonia, Latvia, Lithuania and Poland, involving 15,000 troops from 19 NATO member states and three partner nations, including Sweden, later this month. Like all Color Revolutions, the backers of ‘Electric Yerevan’ are motivated by concrete geopolitical interests. They want to install an anti-Russian government that would withdraw Armenia from the Eurasian Economic Union and break the historical friendship between both states, following the model spearheaded by EuroMaidan’s post-coup authorities. Pashinyan is highly critical of all aspects of Armenia’s special relationship with Russia and has experience with anti-government organizing, hence his present designation as de-facto leader of the Color Revolution.The US also wants to drag Russia into a renewed military conflict over Nagorno-Karabakh, using post-coup newly installed nationalists like Pashinyan to aggravate the situation with Azerbaijan to the point of open warfare, which Russia, with its Collective Security Treaty Organization obligations to Armenia and its 102nd military base in Gyumri, would inevitably be sucked into. The US failed to coax a disastrous Afghan-esque military intervention out of Russia in Ukraine after the EuroMaidan events, but it doesn’t mean that it won’t try to do the same thing in the Caucasus after a potentially successful ‘Electric Yerevan’. Ok, so why bother calling Obama? Needless to say, what little information we are getting from the media – including the Kremlin’s site – cannot be the full story of what was actually said between the two leaders. What may be even more important to consider is what has been left unstated but implied by the call: what the underlying intent was behind the call that was placed by President Putin to President Obama. Can it be correctly interpreted as a gesture of any significance? Because, even if Putin knows from past and present experience that the U.S. is a completely unreliable partner in seeking constructive solutions to the crises discussed in his call to Obama (and that the U.S. is actually at the root cause of most of them), the fact is that any leader who feels a true sense of responsibility towards his people – and to humanity in general – would do absolutely everything in his power to avoid these conflicts, and the catastrophic carnage that looms as a result of them. Pretty simple, eh? And yet, at the heart of the matter there exists a fundamentally different psychological disposition distinguishing the two leaders that speak to the very essence of who they are, the countries they represent, and the largely incomparable degree of sanity that divides them. Born and raised in New York City, Ennio has led discussion groups about ‘High Strangeness’, taught the best stress relief techniques available to man, and annoyed just about everyone he’s ever known about the virtues of eating copious amounts of butter, and smoking. He also enjoys seeing and sharing what’s true on SOTT and has been an editor here since May, 2014. The Ministry of Defense (MoD) is reporting today that this mornings “emergency activation” to immediate combat readiness status of the 102nd Military Base near Gyumri, Armenia (Caucasus region), is directly related to the 4 July “war order” issued by President Putin authorizing the sinking of the US Navy’s guided missile destroyer USS Porter (DDG-78) that just entered into the Black Sea on 5 July. According to this report, on 4 July, President Putin “communicated directly” with President Barack Obama outlining the “exact parameters” of his “war order” and further expressed the Federations “grave concerns” regarding the United States massive global war games that are currently underway, or due to start this month, that include, in part, Talisman Sabre 2015, Jade Helm 15 and Breeze 15. Of the greatest concern to the Federation regarding these massive US war moves, this report continues, is Breeze 15 that includes 30 ships and around 1,700 personnel from Greece, Bulgaria, Turkey as well as the US belonging to the Standing NATO Maritime Group 1 (SNMG1) and the Standing NATO Mine Countermeasures Group 2 (SNMCMG2) that began operations in the Black Sea on 3 July. And heightening these “grave concerns” even more, this report explains, was Greek Prime MinsterAlexis Tsipras stating to President Putin last week that the Greek Navy contingent of NATO’s Breeze 15 war game had been refused permission by his government to participate in it due to that nation’s severe financial crisis, thus leading to fears the Obama regime was planning to use this “exercise” in a coup against that country and its democratically elected leaders. To the fears that the Obama regime is, in fact, planning a coup against the Greek government, this report notes, were first raised this past March when Obama sent to that nation Victoria Nuland, Assistant US Secretary of State for European and Eurasian affairs, who in 2014 headed the coup against the democratically government of Ukraine, as well as the “secret” coup d’etat in Georgia too. Also to be noted, this report warns, Nuland has also “actively subverted” the Greek military structure causing the unprecedented interference seen by that nations former military leaders ahead of this past Sunday’s election wherein US-EU backed banksters were crushed by the citizens of that nation when,to the shock of the EU-US, they voted overwhelmingly against the further destruction of their lives and nation thus angering these Western criminals who want nothing more than to put more billions into their private banking accounts while these people starve. “Hours before anti-austerity demonstrators flooded the streets of central Athens on Friday, a number of retired Greek military officers publicly called for a “yes” vote in Sunday’s referendum on the European Union’s demands, defying Prime Minister Alexis Tsipras’s call for a “no” vote. The contrast between masses of workers denouncing EU austerity and the pronouncements of prominent military figures could not have been starker. Retired General Fragkoulis Fragkos, a former defense minister and one-time head of the Greek army general staff, called for a “loud yes on Sunday.” In 2011, Fragkos was cashiered by then-Prime Minister George Papandreou amid rumors of a coup. But to the greatest “fear/concern” causing President Putin to issue this “war order”, and then directly relay it to President Obama on 4 July, this report explains, is related to the Obama regimes proxy-war being fermented in the Federation’s Caucasus region by CIA-backed Islamic State fighters. MoD strategic analysts in this report further note that last month when ISIS declared a new governorate called Wilayat Qawqaz in this Federation region it was an “act of war” against the Federation perpetrated by the Obama regime as it has already been proven in fact that this terrorist group receives all of its funding from the CIA through a number of secret Swiss bank accounts. To the “red lines” outlined in President Putin’s “war order” given to President Obama, this report continues, one of the first “points” dictates that any assault (terrorist attack) upon the Federation by any CIA-directed ISIS fighters will be considered as an attack upon Russia itself ordered by theUnited States. And to this “war order” authorizing the sinking of USS Porter in the Black Sea, this report says, President Putin has directed in it that “any and all” American military assests operating within 1,000 kilometers (621 miles) of any ISIS attack upon the Caucasus region is to be considered a legitimate target…and which this ship would be within while it operates in the Black Sea. As to how the Obama regime has responded to this Federation “war order”, this report concludes, it is not fully known…other than to note that within 48 hours of receiving it from President Putin, President Obama “fled to the Pentagon” in a rare visit to meet with his top military leaders about their nations ISIS strategy…or to plot the Greek coup…or just start World War III.